Projector Films - new ideas for film makers: The Scriptwriter's Life - why and how? The Scriptwriter's Life - why and how? I'm aware that the crazy diagram above doesn't look that a traditional piece of advice for scriptwriters. So let me tell you how it came about. I'm a scriptwriter and director, as most of you know. I believe, as writers, we all seek to get better. It's hard wired into us - probably because we love redrafting and rewriting. We always seek a better way. Personally, I've always been interested in structure and form. But I know of contemporaries and colleagues that are equally excited about dialogue. So I worked on my structure and they worked on their dialogue. And we got better at writing. But then a few years ago I started doing some corporate work - scriptwriting for financial institutions such as HSBC. Once I got over my initial prejudice that the sales people there were dull bankers I realised that they were on a similar journey. They were trying to get better at their job as well. But they did all this other stuff. They worked just as hard at getting better at their pitching skills, at their mentoring, at keeping an eye on the industry, at speaking on the phone, at having meetings, at keeping in touch, at knowing what to charge. This was all stuff we should do. But no one ever said! No one told me! Yes, we got better at writing over time. But were we getting better at being a writer? Did we know what was really required for a successful scriptwriter's life? I got together with colleagues, fellow writers like Danny Stack and people from outside the industry to put all these ideas together, in one place, on one page, for the first time. I use it everyday. Have it in front of you. Today, in your writing time, don't just do what you want (whatever is easiest in my case). Look at the chart. What haven't you done in a while? Who haven't you spoken to? What's your weak spot? The goal is to help us all be better at making a living from writing. I want to take this further and South West Screen are seeking finance to help me do just that. In the meantime - print it out, use it, share it, tell me what's missing. Get your copy here. What is it? - How do I get a copy? - Read from the beginning on the blog. 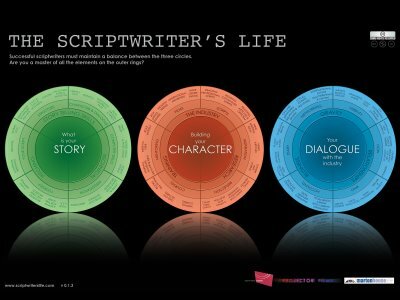 The Scriptwriter's Life diagram is by Tim Clague from a joint venture by Projector Films, South West Screen & MartonHouse. The diagram can be used by anyone and is under a Creative Commons License. 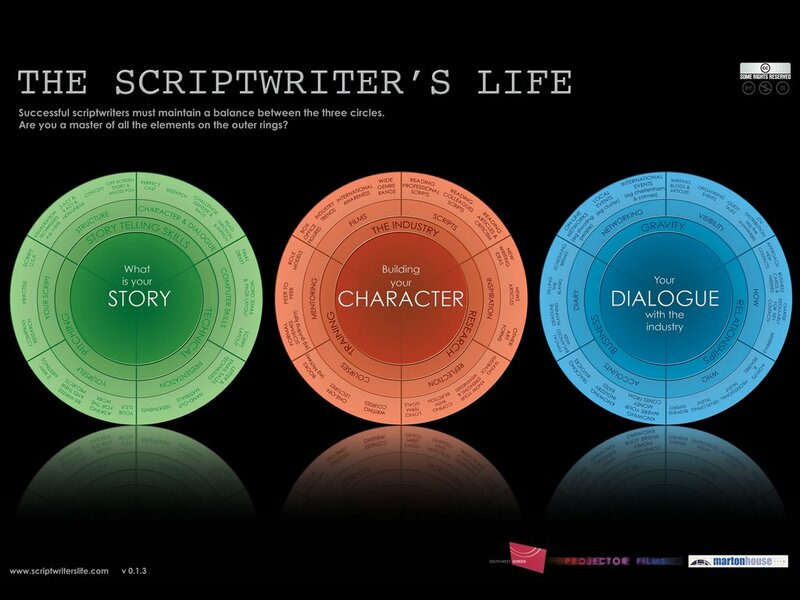 Technorati Tags:Scriptwriter's Life,Scriptwriting,The 3 circles. What is "The blue circle"? What is "The red circle"? What is "The green circle"?